It’s time again for the ‘best of the year’ lists including wine! Ranking wine is a difficult trick. How does an Indiana white stack up against a French red? Wouldn’t an Italian Barolo blow a little Oregon wine away? That’s why Grape Sense’s year-end column just reviews 9 really good wines. The wines are ones you are likely to find at a neighborhood shop. And, these wines all come in at under $20. Why nine? Because I just had to warn gentle readers about the worst wine of 2013. In no particular order or ranking, here are 10 of the best wines I tasted in 2013. Columbia Crest Horse Heaven Hills Les Cheavaux – It would be easy to mis-identfy this Merlot- blend as a Bordeaux wine. While not as nuanced as even inexpensive Saint Emilion ,it has the fruit characteristics to make you look twice at the bottle. It’s 80 percent Merlot, 13 percent Cabernet, and 7 percent Syrah. If you like big bold fruit, you’re going to love it at $15. Château d’Esclans 2012 Provence Rosé Whispering Angel – Rosé rocks and this bottle rocks off the charts. It has a wonderful hint of strawberry and citrus. It’s a beautiful salmon color, dry, light, and pink – what else is there to say about a great summer wine? $16-$23. La Maia Lina 2007 Chianti Classico – I find a lot of Chianti, usually at a lower price point, unbalanced and too acidic. This wine may not have huge fruit but has nice balance. It has the typical cherry flavors with some earthy or woodsy hints. $19. Powers 2010 Spectrum – It’s big enough to please regular wine drinkers, rounded enough for wine novices, and pairs great with about any dish. The blend is 39 percent Merlot, 33 percent Syrah, 22 percent Malbec, 6 percent Cabernet. $10-$13. Les Jamelles 2011 Syrah – It can be found in lots of wine shops and liquor stores. A simple wine doesn’t have to be bad. Not everything in your glass requires 4-5 adjectives to enjoy it. Sometimes plain and simple suffices. It’s got a little fruit and some spice. Not bad for $9. Huber’s Winery Vignoles – The Indy International Wine Competition Wine of The Year represents a movement among several Indiana winemakers to reduce residual sugar while maintaining the fresh fruit. The Vignoles is an outstanding summer sipper but would also be good with creamy cheeses or salty meats. $14.99. David Hill 2011 Estate Pinot Gris – It has bright and pronounced acidity with aromas of stone fruit. Try this with some grilled shrimp. It’s great white wine from Oregon’s Willamette Valley. $18. Tenuta Frescobaldi Di Castiglioni 2010 – Toscana is a really bold wine perfect for steaks, roasts, and hearty pasta. The Tuscan blend is 50 percent Cabernet, 30 percent Merlot, 12 percent Cabernet Franc, and 8 percent Sangiovese. Has notes of currant, plum and dark fruit. Dynamite wine for around $20. Chateau Recougne, 2009 – This is a Superior which is the largest classification in Bordeaux. The wines are quite a bargain. This particular wine had a fresh palate from its 75 percent Merlot, 15 percent Cabernet, and 10 percent Cabernet Franc blend. A Bordeaux bargain at $10-$19. Evil Pinot Noir – This red juice made its way to the U.S. for Octavin’s boxed wines, many of which are pretty good. This $6.99 bottle enjoyed a big display in a high-end Indianapolis market that called to me like a siren’s song. Downside? Don’t buy wines with monkeys on the label! Evil just begins to describe it. If you’d like to revisit my year-end columns from previous years: 2012, 2011, 2010, 2009. The vineyards at Huber Winery stretch over 70 acres. 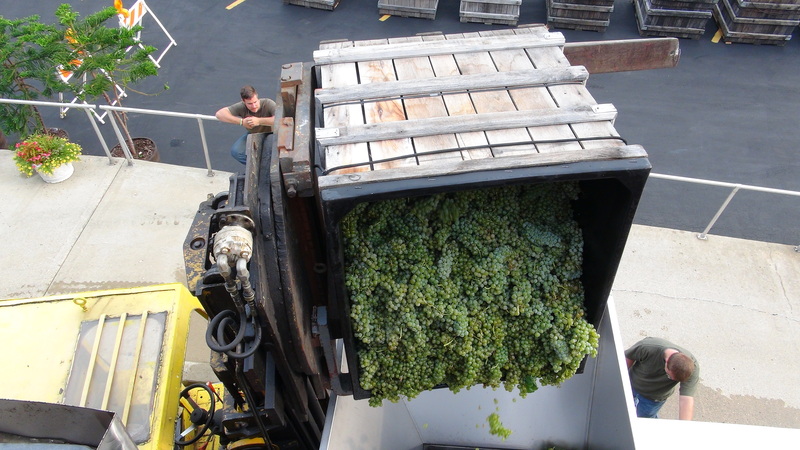 The ideal growing conditions of 2013 has Indiana grape growers forgetting last year’s dry and scorching summer. Indiana wineries and independent vineyards are looking at the potential for a bumper crop of wine grapes. Indiana has nearly 600 acres of vineyard to support what’s soon to be 70 wineries. Most Hoosier wineries buy all or some of their fruit from in- and out-of-state suppliers. Most winery vineyards often are just 5, 10, or 15 acres which provides fruit for a small portion of their production. Two of the state’s biggest wineries, not surprisingly, have the biggest vineyards. Oliver Winery has its beautiful 50-acre, Creekbend Vineyard just a few miles off Highway 37 near Bloomington. 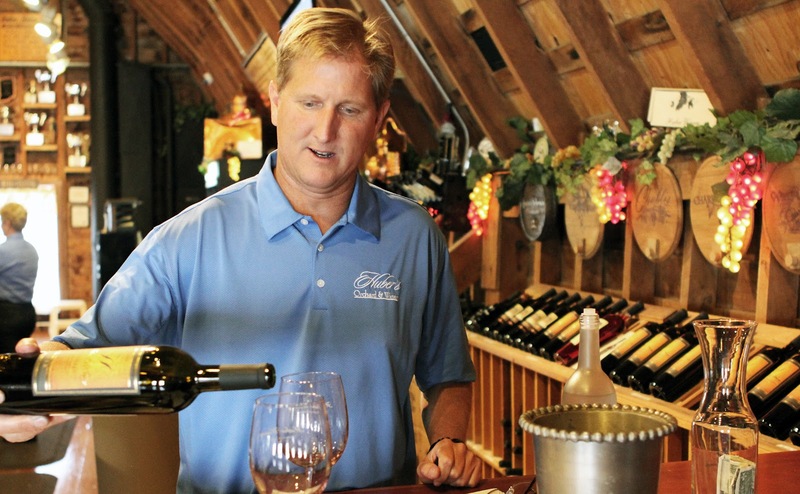 Ted Huber has the state’s largest winery-owned vineyard with nearly 70 acres producing grapes on long-held family property overlooking the Ohio River Valley close to Louisville. “Everything looks perfect and ideal at this point,” said Oliver’s Director of Winemaking Operations Dennis Dunham. “We’ve had a fair amount of rain pre-veraison but it’s is not a big deal. And especially after last year I think there is general thought that getting moisture back into the soil, overall, is a good thing. Veraison is a vineyard term meaning the onset of ripening. White wine grapes become more translucent and red wine grapes turn red. Dunham said the vineyard had issues last year in the hot weather. The lack of rain forced vineyard workers to cut clusters from the vines to encourage ripening of what remained. Ted Huber said the story was similar down south. 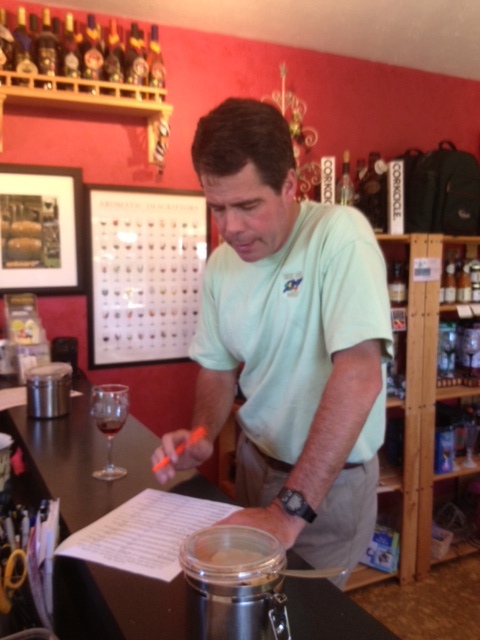 Ted Huber in his Starlight, IN., tasting room. But both men agreed a bumper crop is starting to look certain. “We’re seeing a very big crop right now and we can ripen a big crop.” Huber said. “Unlike last year, with the lack of shoot growth, we had to drop fruit because we didn’t think we could ripen it. This year we have a bumper crop of leaves and shoots, and a full canopy absorbing the sunshine. 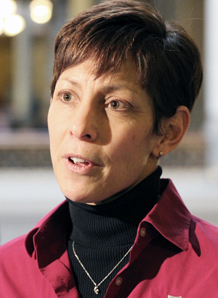 But what does it all mean to Hoosier wine consumers? First, it means there are more Indiana grapes on the open fruit market and the chance for some producers to buy locally. Many Indiana wineries buy fruit from out of state. Second, great wine is made in vineyards and not by winemakers. A great crop should mean a great 2013 vintage. Midwestern wine is always the misbehaving little brother of the so-called “important” wine regions of the west coast. Until a visit to several of Indiana’s best wineries late last summer, it was difficult to argue such slurs were incorrect. Indiana wines are known as ‘all that sweet wine” – Concord, Niagra, and others with cute names. That’s changed dramatically in the last few years. The sweet wines pay the bills for Indiana wineries but also allows the winemakers to go in brave and exciting new directions. One of Indiana’s very best red wines is Huber’s Heritage. The Huber Heritage 2008 HSR is a blend of just Cabernet Sauvignon and Cabernet Franc. “Just” is appropriate because depending on the vintage, winemaker Ted Huber uses different grapes – including Petit Verdot and Malbec. Huber enjoys a very specific micro-climate overlooking the Ohio River Valley that lets him grow grapes that won’t survive in many other Hoosier locations. I’d gladly put this wine against many California and Washington state blends as a great red wine. But back to that snobbish attitude expressed above, it would have to be a blind tasting. I think the Indiana wine would fare well! The wine is aged at least a year in oak for each vintage. The 2008 Heritage has a bright blueberry flavor with big tannin and acid. Additionally, it comes in at a very reasonable 13.6 percent alcohol that makes it an awesome pairing with bold food. I enjoyed the wine with nicely grilled, thick ribeye steaks. Huber wines are available in a number of Midwestern states. The Huber reds are some of the Hoosier states very best. Huber 2008 Heritage, $24.99, Highly Recommended. The Indiana’s Uplands region being declared an American Viticulture Area Feb. 12 is good news for all Midwestern wineries. The U.S. wine industry is driven by tourism. For those who take wine seriously and want to learn more about wine, hitting up AVA-designated areas assures a level of serious winemaking and even quality. Michigan leads the way in the Midwest with four AVAs: Fennville, Leelanau Peninsula, Lake Michigan Shore, and Old Mission Peninsula. Ohio has four AVAS: Lake Erie, Isle St. George, Grand River Valley, and Loramie Creek. Illinois has the Shawnee Hills AVA and shares the Upper Mississippi AVA with Minnesota, Iowa and Wisconsin. The Ohio River Valley AVA is shared by Ohio, Kentucky, and Indiana. Kentucky has no other designated grape production area and Indiana did not until the Uplands announcement. Oliver Winery, near Bloomington, IN., is one of the Midwest’s largest. With production in the 400,000-case range business is good. But Oliver embraced the Uplands news every bit as much as the other eight wineries in the Uplands. The nine established wineries in the Uplands AVA are Best Vineyards Winery, Elizabeth; Brown County Winery, Nashville; Butler Winery, Bloomington; Carousel Winery, Bedford; French Lick Winery, West Baden Springs; Huber Winery, Starlight; Oliver Winery, Bloomington; Turtle Run Winery, Corydon; and Winzerwald Winery, Bristow. 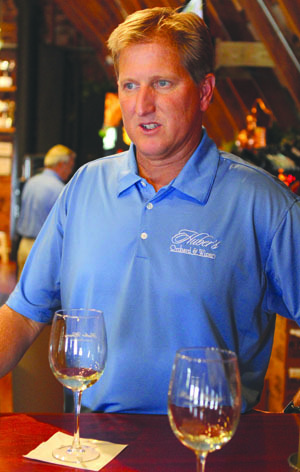 Jim Butler, Butler Winery also near Bloomington, spent nearly 10 years working to achieve the AVA designation. He agreed that Indiana has a niche with white Traminette and red Chambourcin wines that are grown throughout the Midwest and excel in the Uplands region. But he also sees other wines doing well and a future for more traditional plantings. The 4800-square-mile Uplands AVA stretches from the Morgan-Monroe County line near Bloomington south to the Ohio River. The east-west boundaries run from Jasper in Dubois County to Knobstone Ridge near Starlight, overlooking the Ohio River Valley. Ted Huber pours wine for the both of us to taste in the Huber tasting room. A day in Southern Indiana to attend the Uplands Wine Trail “Uncork the Uplands” event was educational, informative, and productive. I’m working on a story about Indiana wine for Palate Press – the National Online Wine Magazine. So I had daytime appointments with Ted Huber at Huber Orchard and Winery along with Jim Pfeiffer of Turtle Run. I’m obviously sitting on most of that material for Palate Press. But the overwhelming feeling of the day was Indiana’s improving wine business. NHuber and Turtle Run are certainly two of the very best in Indiana so it’s not like I was hitting up a few Southern Indiana wineries I have panned in the past. Check out photos from my day at Huber’s and Turtle Run. Huber’s, which I’ve probably written as much about as any Indiana winery, really is a good benchmark for quality. 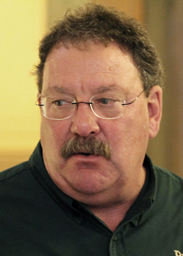 Ted Huber is quick to point out the family considers themselves farmers first. The property, dating back well into the 1800s, has 600 acres of most every fruit and vegetable imaginable. Just 80 acres of the massive operation is in vineyard. That allows Ted and his winemaking team to produce about 50,000 cases of wine annually. I’ve talked with Huber on several occasions but our 30-minute appointment Saturday quickly turned in to two hours. Huber talked about reducing the sweetness in Indiana wine and guiding the sweet wine consumers to a better quality product. We talked about the industry in general, the weather’s impact on his vineyards, and more. And plan plenty of extra time if you want to ask about Ted’s brandy operation. It has become his passion. And though I admit to not being a big spirits fan, the 10-year aged Applejack Brandy was absolutely amazing! 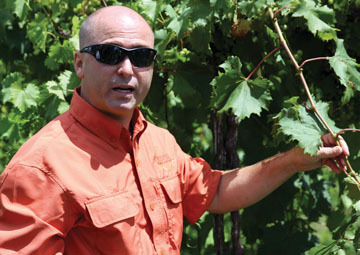 Pfeiffer in his vineyard near Lanesville, IN. Jim Pfeiffer is one of my favorite wine people in the state. His unbridled enthusiasm and willingness to break molds – well heck, Jim doesn’t break them he never used popular molds any way. But the man knows his chemistry and winemaking. The thing that struck me was the similarity in thoughts and efforts between Pfeiffer and Huber. Both are moving their wines away from higher residual sugar while maintaining pleasant fruit Hoosier like and higher quality juice. The wines are far more approachable than the uber-sweet Concord, Niagra and similar wines which have been Indiana’s calling card. I’ll have much more on these two in coming weeks. Uncork the Uplands is just in its second year but already a great wine event, marketing idea, and should be a can’t miss for Indiana wine fans. The word Saturday is next year’s Uncork will be in Bloomington, In. That is a bit easier for Central Indiana folks certainly than the long drive down to Starlight atop the hills overlooking the Ohio River. The Uplands wineries all pour a selection of their wines while Hoosier food product companies show off their edibles. The $75 admission is well worth the price when you consider a portion of the proceeds help several charities. Peacetree Mountain Truffles – Dark chocolate and Chambourcin do mix! The truffles were to die for! Certainly many wine fans know the almost magical powers of a good red wine and dark chocolate. If you’re one of those fanactics check out the website. 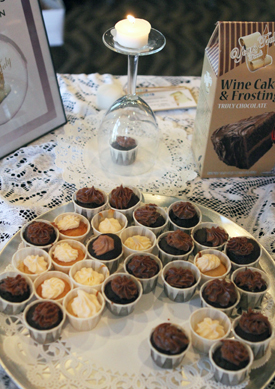 Yours Truly Foods – This company is making cake mixes which will be sold at wholesale to wineries. The samples were a hot commodity Saturday. I loved the rich dark chocolate. The owners Diiana Chamness and Betty Davis came up with the mixes and make a recommendation on types of wines to add to the mix. Unfortunately their website is very incomplete. But you can look for the product coming soon to an Indiana winery near you. Grateful Greens – While Greg Graft’s business is largely a wholesale operation based in Clarksville, Indiana, the basil pesto he served up with fresh mozzarella on a cracker was world class. It was one of the best things I had at Uncorked. de Tours Indiana Wines – Kyle Marcum introduced himself while I was scurrying about Saturday night. Marcus has started an Indiana wine country tour business. He offers a luxury limosine experience that would be great for groups not wanting to drive and taste. 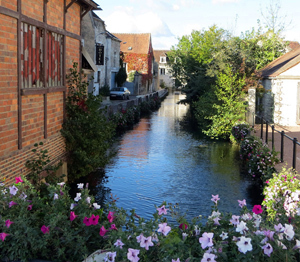 Packages vary in price but start at a reasonable $315 for up to 8 people. NEW ALBANY, In. – “Best” is always a label best used infrequently but few in the know would argue Huber Wines and Turtle Run are among some of the best and most interesting wines in Indiana. Tonight is the Uncork the Uplands food and wine event at Huber Orchard and Winery and I’ll be hitting it up in just a short bit. But I took the opportunity to come down early and spend some time with Ted Huber and Jim Pfeiffer of Turtle Run for a Palate Press story about Indiana wines. I found Ted in a talkative mood and eager to share the processes he uses to make some of Indiana’s best wines/. We talked about the evolving consumer demand and palate for lighter wines, lower alcohol, and a bit less sweet. That’s right – Indiana consumer trends in tasting rooms are showing a developing palate for wines not as sweet as the typical concords and niagra wines of the past. Pfeiffer shares that passion for less sweet wines as a winemaker and as a health concern. Pfeiffer is more mad genius than Huber’s calculating step by step wine making but both turn out bottles of wine that would stand up to many others not just across Indiana but the nation. 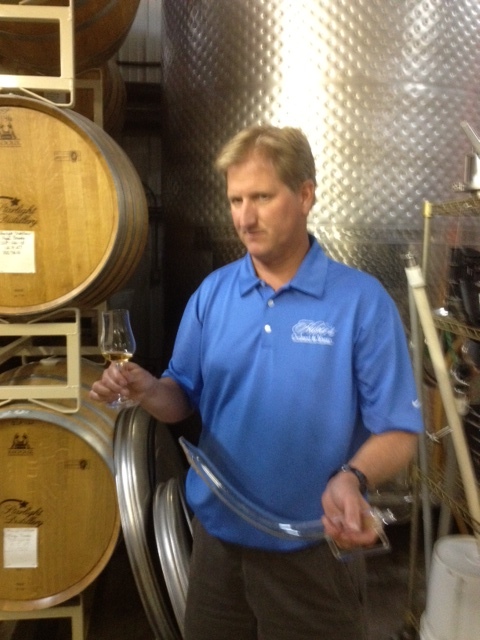 Huber also has an over-the-top passion for brandy. Before today I believe I had tasted Brandy one time while in Germany. Today I barrell sampled brandy in oak for two months, two years, five years and the final product with more than 10 years aging. I admit, that old stuff is pretty tasty! Pfeiffer is an enthusiastic guy that go on and on about the chemical properties of wine – glucose vs fructose – and then more. But he makes a compelling case about reducing sugar in wines which not only are more palate pleasing but healthier. Jim makes interesting blends and is part Picasso and half mad scientist with some crazy blends that come out tasting like magic. Both winemakers produce the best Chambourcin I’ve had ever. When done correctly, Chambourcin has Pinot Noir like qualities with nice body, a light mouth feel, and pleasing fruit. When done poorly, as it often is in the Hoosier state, it comes out smelling like an old musty shoe. It’s off now to Uncork with Upland Wine Trail wineries, Hoosier food producers, Bloomington Chef Daniel Orr, a mixologist, and more. 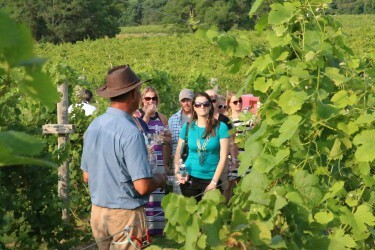 For Hoosier, there is a great Indiana wine event in southern most Indiana Saturday, July 21. The second-annual “Uncork the Uplands” food and wine pairing event is set for Huber Winery. The event features food from south-central Indiana paired with wines from the nine Uplands Wine Trail wineries. 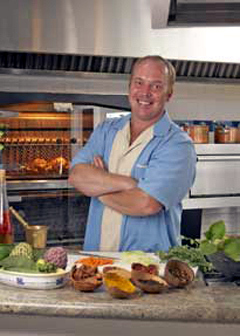 One of the highlights this year is featured guest Chef Daniel Orr from FARMbloomington restaurant. He will be doing a presentation during the evening’s events. The Uplands Wine Trail includes Best Vineyards, Brown County Winery, Butler Winery, Carousel Winery, French Lick, Huber, Oliver, Turtle Run and Winzerwald. Tickets can be ordered in advance at the Uncork the Uplands website but are also going to be available the day of the event. Tickets are $75 per person. A portion of the evening’s proceeds will go toward Ivy Tech of Southern Indiana’s Viticulture Enology Sciene & Technology Alliance and TheFARM Fund raising future culinarians at Ivy Tech in Bloominton. Olinger Indiana, Monarch Beverages, Indy Wine Competition, Ivy Tech, Innovative Labeling Solutions, The Sunnyside of Louisville, Orange County Convention and Visitors Bureau and the Monroe County Convention and Visitors Bureau are sponsors. To to the website and check it out. Huber’s Winery is worth the visit any time of year but this special event makes it doubly worth your effort. As of now, I plan on attending. I hope to see you there.